Bee rides is a kind of self control plane amusement park rides , its cute cartoon image makes it more compelling.This equipment is rotating type equipment, bees in their rotating at the same time along with the body of the rise and fall. Sitting on it likes flying in the Sky. It is very comfortable, totally relaxed and very exciting. Rotating bee rides has amazing shape , colorful apperance , fadeless paint . It is decarate with handreds of LED lights , and music system .This self control plane are very popular with children and families . 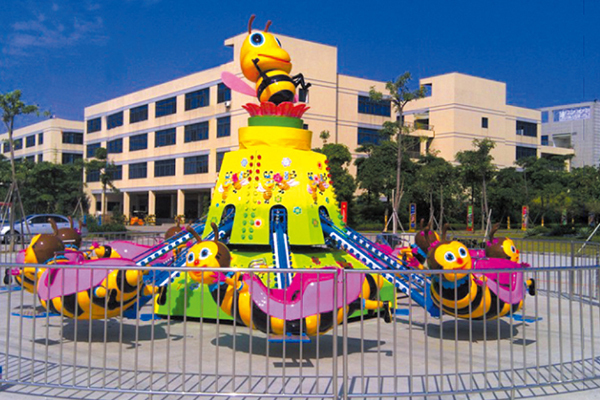 Rotating bee rides is widely used in amusement park rides , theme park, shopping mall, fairground center, outdoor playground, etc .